Pretty slip-on top with V-neckline, button-front placket and side slits. Roomy shorts with full elastic waist. Cotton/polyester knit. Machine wash & dry. Imported. Approximate length: Misses - Top-26", Inseam-9"; Women's - Top-28", Inseam-10". 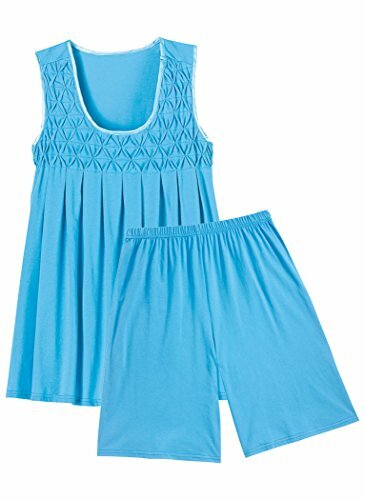 These blue shorty pajamas for juniors have a tank top with pajama shorts bottoms. 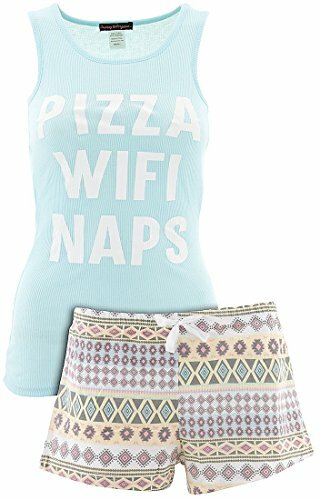 PIZZA, WIFI, NAPS is printed across the front. The pajama shorts have an elastic waistline, faux drawstring and nice fit. The 60% cotton 40% polyester blend fabric is machine washable. These Grumpy and Gorgeous brand pajamas are comfy to wear. DREAM LOVE SLEEP is printed in gold foil across the front of this shorty pajama set for juniors. The pajama tank top has a laced back design. The pajama short bottoms have DREAM printed along the waistband and DREAM LOVE SLEEP printed at the hip. The 100% cotton knit fabric is machine washable and feels ultra-comfy. These Love Loungewear brand pajamas are blue and navy. Spiderman I'm amazing hawaii art. Junior slouchy tank and roller boxer 2 piece set. Comfortable rayon and polyester blend fabric. Easy pull on covered elastic waistband on roller short and contrast piping on side seam. Wear the tank out or lounge around the house in Spiderman 2 piece set. 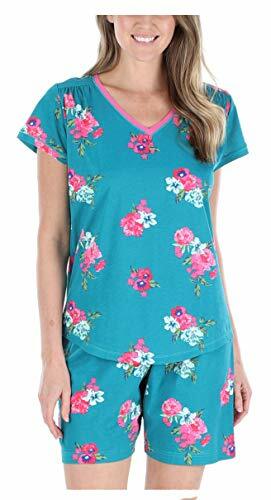 This classic short sleeve short leg pajama set from Hanes is great all year round. The cotton polyester blend is easy to care for. Machine wash in cold with like colors and tumble dry. This set has a fuller cut for easy movement. Plaid patterns may vary slightly within the color selected. Item received may not be identical to the item pictured. This blue and gray shorty pajama set for women is Pillow Talk brand. The short sleeved top has roomy neckline and the yellow sun printed on the front pocket. The caption says POCKET FULL OF SUNSHINE. The pajama short bottoms have an elastic waistline, adjustable drawstring and relaxed fit. The fabric is 95% rayon and 5% spandex knit that is machine washable and comfy to wear. 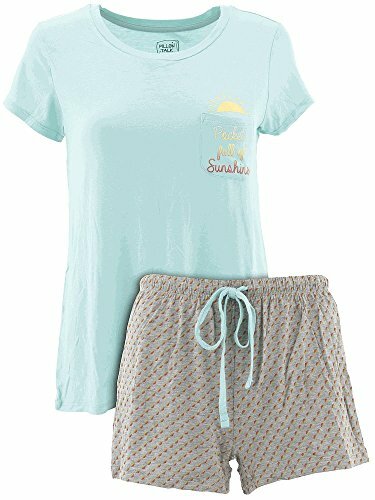 This classic short sleeve short leg pajama set from Hanes is great all year round. The cotton polyester blend is easy to care for. Machine wash in cold with like colors and tumble dry. This set has a fuller cut for easy movement. These PJ Couture brand shorty pajamas for women have SWEET DREAMS printed across the front. The blue tank top has pom-pom ball fringe along the bottom hem and eye lash appliques as part of the print. The cotton polyester blend fabric is machine washable and ultra-comfy. The pajama short bottoms have an elastic waistline, relaxed fit and are printed blue with white stars. Sleeveless top with smocked yoke and satin trim. Pull-on shorts with full elastic waist. Cotton/polyester jersey knit. Machine wash & dry. Imported. Approx. lengths listed. Misses - (Top-26", Inseam-9"); Women's - (Top-28", Inseam-10"). 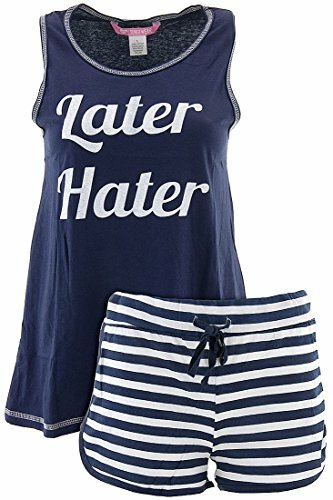 This blue shorty pajama set for juniors has LATER HATER printed across the front. 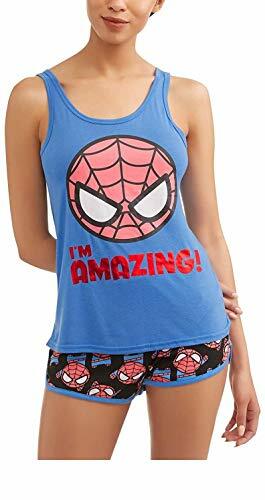 The pajama top has a tank top design. The pajama short bottoms have an elastic waistline, an adjustable drawstring and nice fit. The 100% cotton knit fabric is machine washable and feels ultra-comfy. These Love Loungewear brand pajamas are blue with striped bottoms. 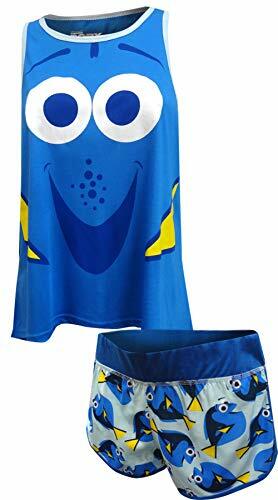 Finding dory tank and roller short 2 piece set. Cos play explosive tank graphics. Adorable dory swimming toss print on roller short. Slouchy tank is perfect to wear out or lounge around in your roller boxers at home. Comfortable wear now fabrics enjoy. 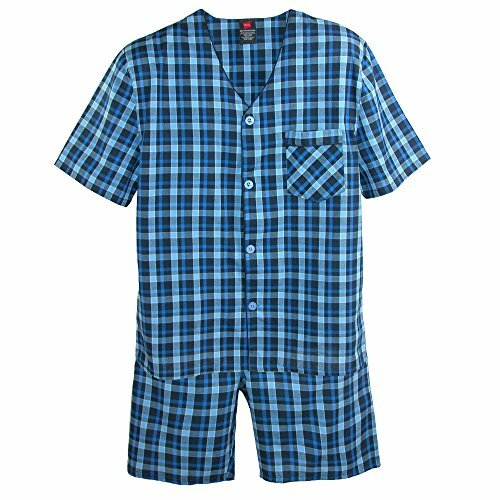 These Taylor Paige brand shorty pajamas for junior's have a blue dip dyed print. The top has HELLO, WEEKEND printed across the front. This two-piece pajama set has a racer-back top and pajama shorts bottoms. The blue top has faux rhinestones in the white lettered text. The dark blue pajama short bottoms have an elastic waistline, adjustable drawstring and nice fit. The 100% cotton knit fabric is machine washable and is comfortable to wear. 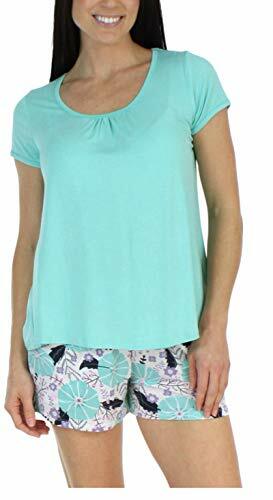 Our bSoft bamboo short sleeve shirt and shorts pajamas set is ultra soft, lightweight, eco-friendly and moisture-wicking, which makes them perfectly breathable for temperature regulation. Our breathable pre-shrunk 100% cotton jersey top and shorts set features a slightly stretchy and relaxed fit and is perfect for sleeping in warm weather as well as lounging around the house. 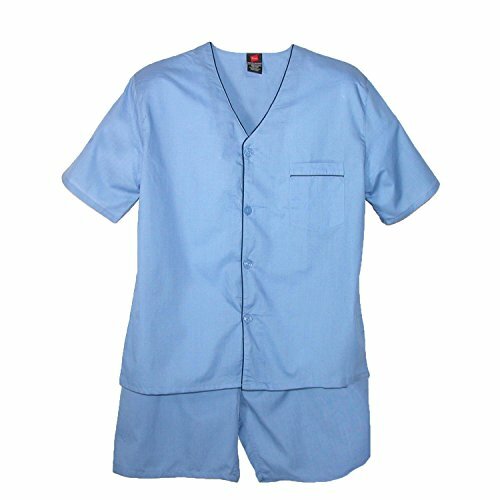 Compare prices on Blue Shorty Pajamas at LiveSaler.com – use promo codes and coupons for best offers and deals. We work hard to get you amazing deals and collect all avail hot offers online and represent it in one place for the customers. Now our visitors can leverage benefits of big brands and heavy discounts available for that day and for famous brands. We try to makes comparison shopping easy with Product Reviews, Merchant Ratings, Deal Alerts & Coupons. Find Deals, Compare Prices, Read Reviews & Save Money.